Winsor & Newton Galeria is a collection of mediums designed to enhance the creations of artists working with acrylic paint, such as Winsor & Newton’s Galeria Acrylic Colourrange. Extending the artist’s working time, by slowing the drying rate of the paint, Galeria Fluid Retarder allows smoother blending of acrylic colour. Any liquid which changes the consistency of the paint it is mixed with may be classed as a medium. Winsor & Newton Galeria Acrylic Mediums are designed specifically for use with acrylic paints, and range from thin glaze to thick impasto mediums, with a variety of choices in between. By changing the properties of paint, a medium extends the possibilities of how an artist works with the colour, and affords a plethora of exciting techniques and effects. Winsor & Newton Mediums Finder provides an easy, interactive method of choosing the correct medium, for the artist to achieve the desired effect. 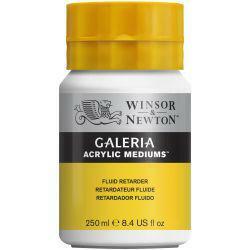 Why choose Winsor & Newton Galeria Fluid Retarder? All Winsor & Newton Galeria Mediums are fully intermixable, and can be layered or mixed on the palette, allowing the artist to fully explore both the textural and visual properties of Acrylic Colour. Only a few drops of Galeria Fluid Retarder needs to be added to acrylic colour, medium or gel to extend working time by up to 50%, and increase flexibility. How do I use Winsor & Newton Galeria Fluid Retarder? Fluid Retarder does not contain sufficient acrylic resin to act as a binder, and should only be used in the amount needed to achieve the desired effect. Adding more than 25% Fluid Retarder to colour will prevent the paint from drying. Can you explain some of the terms used when painting with Acrylic Mediums? Click here for a glossary of Acrylic painting terms, including the different types of medium. It wasn't exactly what I thought I was getting (my fault, not the company's) It does the job but it's very liquid! I thought it was more gel-like! By buying this product you can collect up to 6 loyalty points. Your cart will total 6 loyalty points that can be converted into a voucher of £0.06.